In 2006, percussionist, producer, and educator Jim Roberts found himself at the 10th anniversary of PeaceJam, an organization dedicated to inspiring kids by bringing Nobel Peace Prize Laureates to their school. Twelve laureates including the Dalai Lama and Desmond Tutu talked about their experiences of struggle and visions of change. The words of Jody Williams, an American activist who started the International Campaign to Ban Landmines, shook Roberts powerfully. Roberts took the challenge. 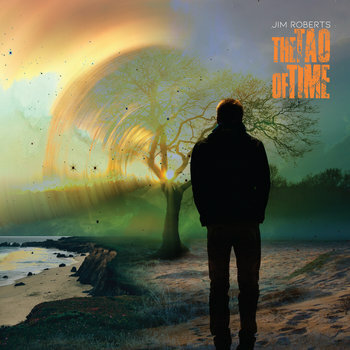 He devoted years to doing something, crafting The Tao of Time (release: October 26, 2018), a concept album as diverse and unexpected as his wide-ranging musical influences. Inspired by peace activists and other agents of change--the wonderful Peace Pilgrim’s words, for example, create a pivot in the album--The Tao of Time explores the nature of time, history, human experience, and how the past can but does not have to determine the future. Throughout this arc run the drums, rhythms, and grooves that have inspired Roberts since childhood, when his obsession with drumming first came to light. Along with percussion training, he also studied with master djembe player Khalid Saleem and played with the Chuck Davis African-American Dance Ensemble (Davis gets a futuristic homage on “The Island of Ujoma”). He studied Afro-Cuban percussion with Steve Bloom, as well as dedicating himself to understanding Brazilian rhythms and instruments. He toured great swaths of the country and recorded on three albums with GRAMMY-winning bassist Victor Wooten, who narrates “The Voice of Wisdom” and appears on Roberts’ Ancient Hand album. This voice speaks of other possibilities, suggesting how we might work to build peace: “The drums’ connection with language and communication is a key thing in the development of humankind,” Roberts reflects. These statements are big, getting at the fiber of our shared experience as humans. The album’s electronic-inflected title track gathers the many threads, inspired by the sorrow Roberts felt when a friend lost his infant son. “‘Tao of Time’ is about the cycles of life. “I wrote it while thinking about what my friend was going through, while watching the water on the Pamlico River. I realized that there were eons of time before me, just like music. It will be here long after I leave.” That is the wisdom Roberts has found in time--and one way he hopes will bring more people to the universal nature of peace and awareness. Also available at CD Baby! Click on arrows below. Release dates announcements - sign up here! To get information on The Tao of Time release, private lessons, Saxapahaw & Chapel Hill group drum classes and more - sign up here!